Our low-viscosity, non-blushing High Performance epoxy system cures clearer and slightly more flexible. It's ideal for clear coating, laminating, vacuum bagging, and wooden boat builds. Pair High Performance resin with any of three TotalBoat High Performance hardeners in a simple 2:1 mix ratio by volume to control working & cure times, with no time-consuming washdowns between coats. 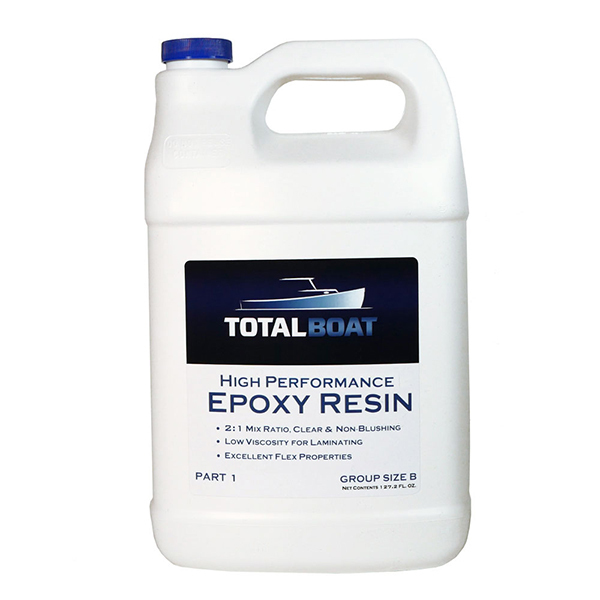 Note: High Performance Epoxy Resin group sizes correspond to group sizes of TotalBoat High Performance Fast, Medium, and Slow Hardeners (sold separately). 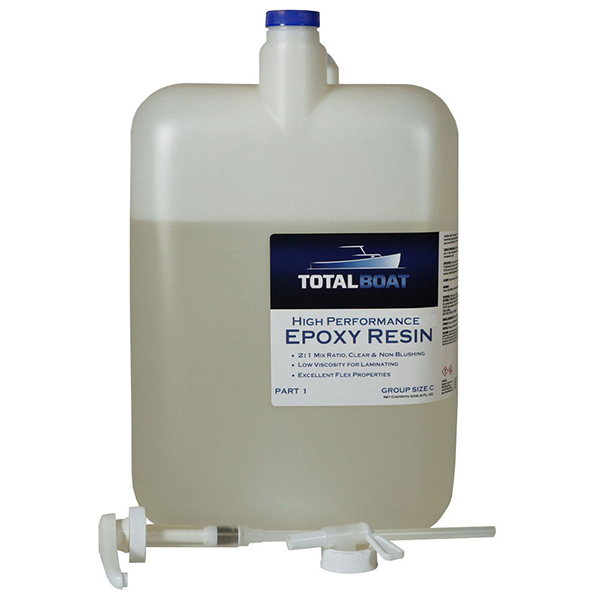 TotalBoat 2:1 Epoxy Pumps sold separately. 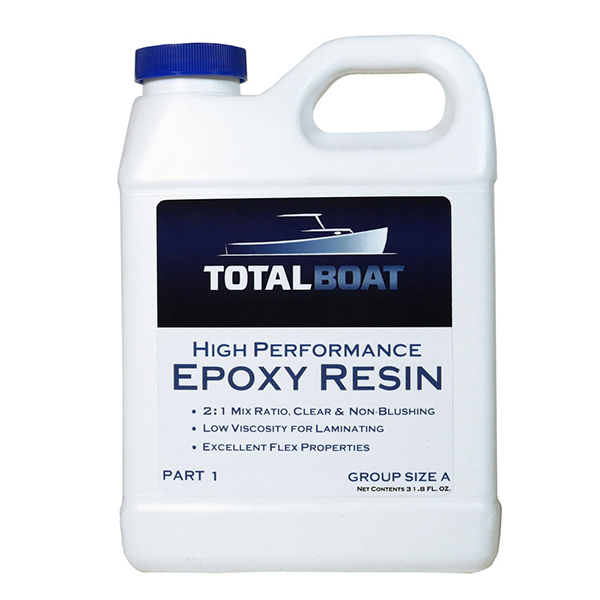 Use TotalBoat High Performance Epoxy Resin for a moisture-resistant cure that’s more clear and slightly more flexible than traditional 5:1 epoxy resin systems. Its greater elasticity is especially ideal for building and repairing wooden boats, kiteboards, surfboards, cedar strip canoes, and kayaks prone to flexing during use or with fluctuations in temperature and humidity. The simple 2:1 mix ratio of 2 parts resin to 1 part hardener also make it easier to get a perfect cure every time—especially with the TotalBoat 2:1 Epoxy Pumps. This versatile 2:1 system can be used for so many different projects. Use unfilled for laminating, hand layups, coating, and vacuum bagging. Or, add TotalBoat fillers for a strong adhesive, filleting material, or fairing compound. So many capabilities at such a great value. And it’s packaged to match the group sizes of the TotalBoat High Performance Hardeners, so there’s no waste. Its clear-as-crystal, level finish is perfect for clear coating projects like showcasing the cool texture of carbon fiber fabrics, or for emphasizing wood’s natural color, grain, and beauty. And, because there’s no amine blush, you won’t waste time on messy washdowns between coats, or worry whether you removed every trace of surface blush, so you can apply the next coat confident it will cure properly. Life is about making hard choices. Pot life is about making hardener choices. With our High Performance Epoxy Resin, whether your goal is to buy more time or speed up the process, we make the choice easy by offering Fast, Medium, and Slow High Performance Hardeners that let you modify working properties and cure time to your advantage. If you want the fastest cure and shortest pot life, or if you’re working in cooler temperatures, use the High Performance Fast Hardener. For most common applications, use the High Performance Medium Hardener. If you’re working in warm conditions, or you need a longer working time, use the High Performance Slow Hardener. Likewise if you’re new to using epoxy resin, you may find the longer working time and cure time helpful. For even greater control over working properties and cure time, you can devise a custom concoction of any of the three High Performance hardeners. Just be sure to maintain the proper mix ratio of 2 parts resin to 1 part hardener by volume. Its high points are its "lows"
Our High Performance Epoxy Resin has a low 2:1 mix ratio that makes it very easy to measure precisely for a proper mix and a reliable cure. It has a low viscosity that flows easily to saturate the fibers in composite fabrics for better hand layups and vacuum bagging projects. Excellent thin-film characteristics provide smooth flow-out and self-leveling ideal for coating and laminating. Its low drip properties ensure smooth and strong coating, laminating, and bonding, and it cures with very low shrinkage. Plus its low VOC content and low odor make it more suitable for shop or garage use where indoor air quality is especially important. Which TotalBoat High Performance Hardener Should I Use? High Performance Fast Hardener – Use High Performance Fast Hardener for the fastest cure and shortest working time at room temperature, or for an overnight cure in low temperatures (minimum 55°F). High Performance Medium Hardener – Use High Performance Medium Hardener for most common applications, or for an overnight cure at room temperature (77°F). High Performance Slow Hardener – Use High Performance Slow Hardener for extended working time and cure time at room temperature, or when working in warmer temperature conditions.